What do your exes, favorite Netflix show, and better UX have in common? Closure. All of them need proper closure. “Sequences of actions should be organized into groups with a beginning, middle, and end. Informative feedback at the completion of a group of actions gives users the satisfaction of accomplishment, a sense of relief, a signal to drop contingency plans from their minds, and an indicator to prepare for the next group of actions. 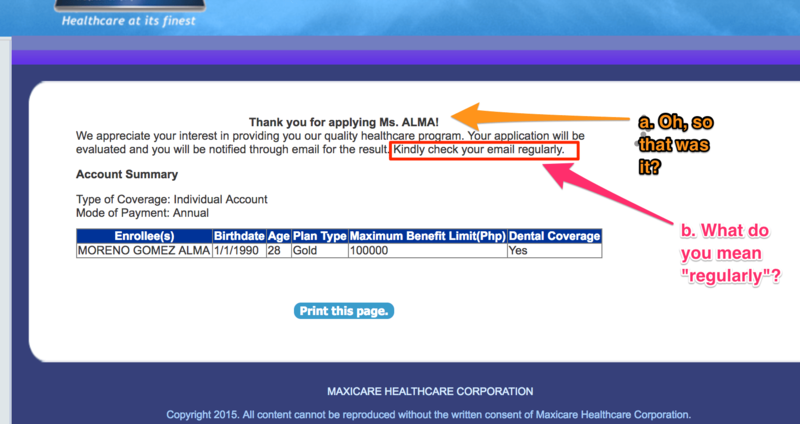 Lately, I’ve been doing some research on HMO providers in the country and I came across Maxicare’s website. The website copy and user flow were both okay (from my perspective as the user, I don’t know with other types of users) but not really great. In fact, there was a little cognitive friction while I was filling out an application form for one of their plans. I almost called it quits prematurely because I had more questions about the package I chose, and I thought I need to do more research. After all the confusion and countless furrowed brows (hello forehead wrinkles!) while filling out the form, I eventually made it to the end. Go ahead, click to enlarge image. Alma Moreno is my alter ego. Whew! Finally, the sense of closure that I’ve been waiting for. Yet why do I still feel iffy and uncertain about it? a. Oh, so that was it? b. What do you mean “check your email regularly”? What if user A’s version of “check your email regularly” is checking it 3x a day? What if user B’s version of “check your email regularly” is plowing through her inbox once a week? For UX consultant Mario Quintana, well-designed forms are scannable, conversational, provides closure, and gives certainty. 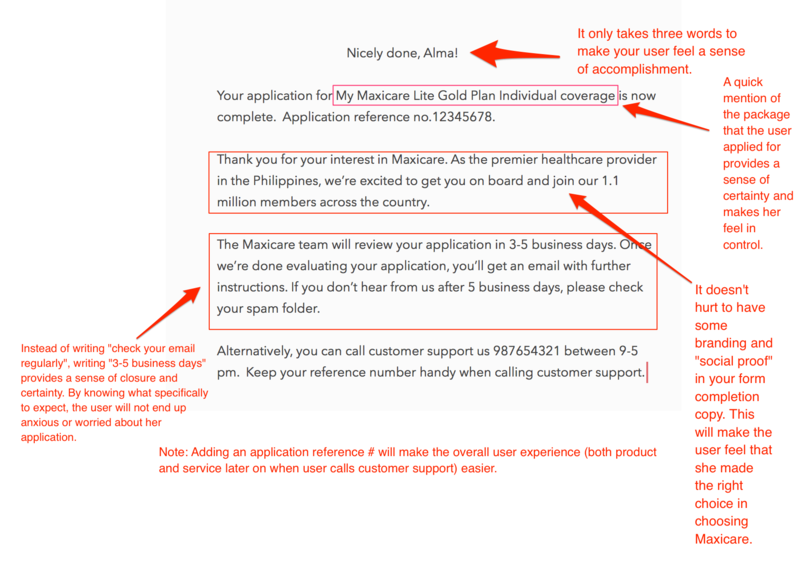 With these in mind, I’m putting my UX writing chops to the test by helping improve Maxicare’s form completion copy. Go ahead, click to enlarge image. Ultimately, performing more user research such as usability tests, contextual inquiries, and content testing can further help us find the right words and phrases in designing the application form. As UX writer John Saito of Dropbox says — keep it simple, straightforward, and human. It doesn’t have to be catchy or clever (this is common practice in marketing, my heart breaks into a million pieces whenever someone says “just write something catchy!” ), but bonus points to you if you can make it simple, human, and clever at the same time. Scrimp on user research now, pay a high price later. Do you have a startup idea that you’ve been meaning to develop or thinking about adding a new type of service to implement? You make prototypes of your idea or create a blueprint of your supposedly new type of service. If you’re lucky and you have sufficient funds, you assemble your team of developers and creatives to help you make your idea into a tangible product or service. When your product or service blueprint is done and ready to implement, you cross your fingers and do every new marketing trick you’ve read about online to help spread the word about your new offering. If your marketing team did a great job, you’ll end up luring new customers but it turns out that there’s nothing valuable or innovative about your new offerings. In the end, you end up losing these new customers. No one understands your new products or services because you don’t know your prospects enough. You end up blaming the marketing or advertising team for doing a lousy job. After noticing a lackluster response to your new product or service, you decided to do some market research to help you “market” to your prospects the right way. Your market research team gathers demographics data such as age, gender, location, etc. Fun fact: All three scenarios are far from giving you lasting success when creating new products or services. In this approach, you’re putting user behavior as an afterthought instead of considering it front and center. For instance, a local bank advertised that setting up a new bank account with them is super easy. I can even do it online! However, it turns out that when I (as a prospect) tried to sign up online for a new account using my mobile phone, their mobile website ended up telling me that I need to use Internet Explorer on desktop mode. I left their mobile site feeling that they’ve let me down. I decided to go for another bank instead. If they’ve done user research, they would have realized that their target prospects are more likely to use their smartphones or a different browser when signing up for an account online. Furthermore, they would have found out specific nuances and quirks in their prospect’s behavior when signing up for a new savings account. When done right, user research can help create long-term success when introducing new products or adding more services. Instead of following the traditional design-first-behavior-later model, how about giving the reverse a try? This model is the core of human-centered design. The team behind the Membership Puzzle Project calls it “behavior first, rules second” philosophy. Many brands, companies, and organizations market themselves as purveyors and advocates of creating wonderful, meaningful (and who would even forget “delightful!”) user experiences these days. In reality, they don’t even prioritize hiring UX researchers and product designers in their teams. They put a lot of effort hiring programmers, visual designers, and marketers but the UX team takes the backseat. Assemble a UX team composed of researchers, designers, and content strategists (or a UX writer). In some cases, a designer or writer can be a researcher at the same time or vice versa. It’s extremely rare to find one person who can do all of these aka the UX unicorn. The team will meet with stakeholders including teams from marketing, sales, and customer support to figure out the organization’s business goals or the current demand from existing customers. If it’s a new company, the UX team will conduct user research to validate your product or service idea. Can we actually make what they want? Once you have the research findings laid out, you can proceed to the first step of the traditional model mentioned earlier: you make prototypes of your idea or create a blueprint of your supposedly new type of service. Afterward, you can perform usability tests, reiterate when needed, and release your product or service into the wild. Rinse and repeat. Besides increasing the likelihood of successful products and services, the behavior first, design later model can also potentially save you precious time and funds in the long run. Scrimp on user research now, pay a high price later. Instead of offering a solution without knowing the specifics of the problem, the behavior-first-design-later model allows you and your team to design well-thought-out products and services that your users and customers actually need. Months ago, a curious stranger who stumbled upon my Twitter profile asked: what the heck do I mean when I write “nestled within a comma’s curve” as my whereabouts in this corner of the universe? I began using the phrase around three years ago when I felt uncomfortable sharing my exact location on my social media profiles. Although there’s no doubt that Zuck and his minions can easily figure out my exact location through their sneaky algorithms or some ancient alchemy, it was at least comforting to think that I’m not giving my coordinates that easy. In hindsight, it gave me a false sense of privacy. Privacy stuff aside, what am I hinting at when I say “nestled within a comma’s curve”? 1. Let’s start with the most obvious. A comma is a punctuation mark that you’ll end up wrangling with when you’re writing — from print ads to thousand-word essays to lengthy novels that you can’t seem to finish reading. Whenever someone reads “nestled within a comma’s curve” and takes a pause for a second to think about what it means, my writerly heart jumps with glee! All the more when they’ll associate the phrase with writing, words, or any form of wizardry that involves putting letters together to tell a story. After all, it’s what I do for a living. 2. As for the not-so-obvious meaning, what comes to mind when you read the words nestled and curve? Can you envision someone who’s sitting comfortably in one of those cozy lounge chairs? If you can, hats off to you because it’s exactly one of the images that I want you to think about when I wrote that phrase! As someone who scores high on the introversion scale, I’m perfectly okay with the idea of lounging cozily in a chair with a good book or listening patiently to a friend who’s sitting across me. 3. Finally, let’s take a look at its metaphorical meaning by considering one of the comma’s major roles in writing: to join two or more independent sentences. With that said, I have this slight obsession with unifying contradictory opinions, ideas, or thoughts. The idea of finding that one main thought or commonality that unites two or more opposing ideas sends me into a frenzied state of aha moments. My reasons (particularly the last one) may sound too far-off to you, but there’s a certain sense of allure and artisty when making up new metaphors or symbolisms in language. Yesterday, I came across this gem by design researcher and strategist Audrey Crane on the qualities of a good UX research moderator and its similarities to a crystal goblet.